Advocate for dogs prevents parasite infections, fleas, heartworm, gastrointestinal worms, mites and lice. Just apply this product once a month on the back of your best friend’s neck, and let the treatment do the rest. You’ll sleep better in the knowledge that you’ve given your dog some of the most scientifically sound flea and worm protection around. Does this product prevent lung worms? Yes, Advocate prevents lungworm infections. 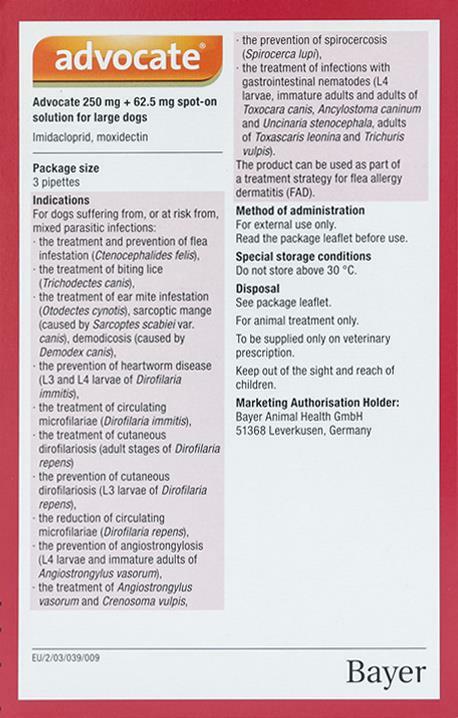 Does this product protect from heartworm developing inside the dog and not just topical? How does this work? Yes this product prevent your dog from heartworm disease. However it doesn't treat it if your dog already has this disease. No im sorry it only covers Fleas, Heartworms, & Gastrointestinal worms. Thank you! I was pleased with the product I ordered and it arrived as indicated. The price was good and I would use your company again. Great service and product was delivered in the time frame. I AM VERY HAPPY WITH YOUR COMPANY AND FOR THE PRODUCT, ESPECIALLY THE SPECIAL PRICE. KEEP UP THE GOOD WORK.